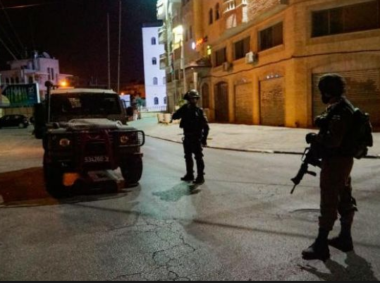 Israeli soldiers abducted, on Monday at night, at least ten Palestinians from their homes in several parts of the occupied West Bank, the Palestinian Prisoners’ Society (PPS) has confirmed. The PPS stated that the soldiers invaded and ransacked dozens of homes in Ramallah governorate, in central West Bank, and abducted six Palestinians, identified as Mohammad Sami Nakhla, Mohammad Eyad Dweik, Samed Nabil Abda, Ala Hasan Mohammad, Tareq Akram Hamed, and Qussai Salem. In Bethlehem, south of occupied Jerusalem, the soldiers abducted Moath Abu Hamdi, 22, Tha’er Saber Deeriyya, 22, and Ali Shaher Taqatqa. In occupied Jerusalem, the soldiers abducted Mohammad Issa Hmeidan, from Biddu town northwest of the city.